Why are AI and IoT perfect partners for growth? IoT that is augmented and enhanced by machine learning is effectively multiplying the impact and benefit to those businesses who are adopting these complimentary technologies. 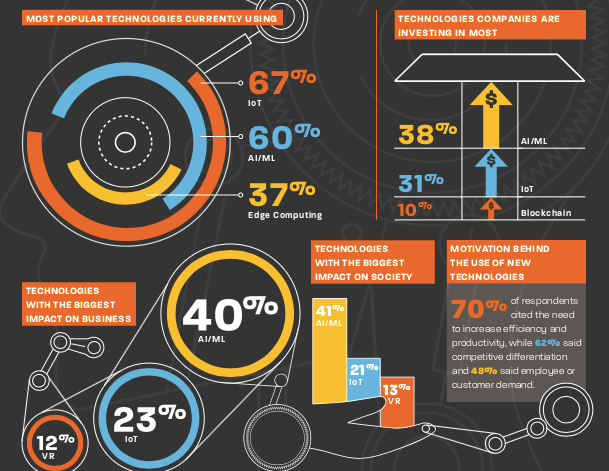 A recent survey of 500 IT professionals including 100 top IT executives suggested not only are IoT and AI the most popular technologies currently in use, but also top of the list for further investment for businesses seeking increased efficiency and competitive advantage. But why are IoT and AI so far in front of other popular technologies such as Edge Computing or Blockchain? It is because IoT that is augmented and enhanced by machine learning is effectively multiplying the impact and benefit to those businesses who are adopting these complimentary technologies. In fact, AI is an integral element for success in today’s IoT-based digital ecostystems. The reason is simple. Combining IoT with rapidly advancing AI technologies can create ‘smart machines’ that simulate intelligent behaviour to make well-informed decisions with little or no human intervention. The result is an acceleration in innovation which can significantly boost productivity for the organisations involved. Little wonder then that the IoT and AI markets are developing rapidly and in tandem. The AI market is growing quickly. Bank of America, Merrill Lynch predicted that the robot and AI solutions market would surge to US$153bn/y by 2020. They suggested that adoption could boost productivity by 30% in many industries, whilst simultaneously cutting manufacturing labour costs by between 18-30%. As AI matures, the technology is becoming more robust at handling multiple situations with increasing accuracy. This means that AI is becoming more likely to be deployed at scale with reduced (and reducing) human intervention – thus magnifying the positive impact solutions are likely to have. 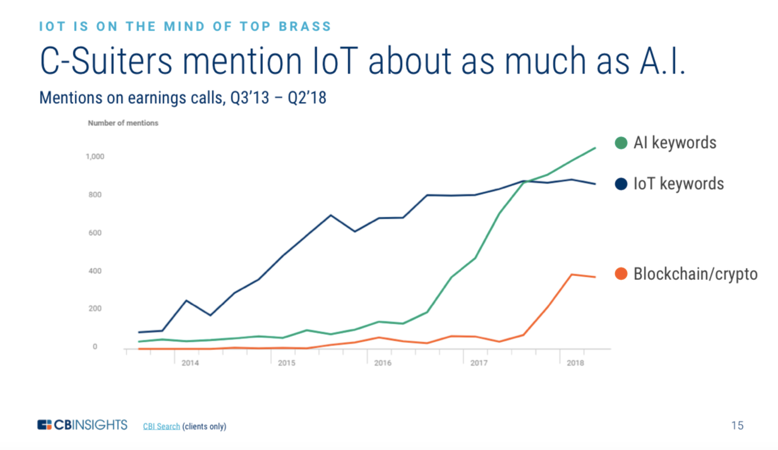 The IoT market also continues to expand at breath-taking pace, driven by a combination of factors illustrated in the diagram below and including: decreasing cost of data storage, the advent of cloud and fog computing, increasing data transmission capabilities and a wealth of IoT sector investment. To prove this point, the IDC estimates that the number of devices connected to the internet will surge from 11bn in 2016 to 80bn in 2025, with a corresponding boom in data generation from 4.4 zettabytes of data in 2013, to 44 zettabytes in 2020 and on to 180 zettabytes in 2025. So whilst sensors from devices deliver data, data can only support the creation of value if it is actionable. IoT needs AI and vice versa. Where IoT provides data, AI has the potential to unlock real-time responses, providing both context and creativity to drive smart actions. 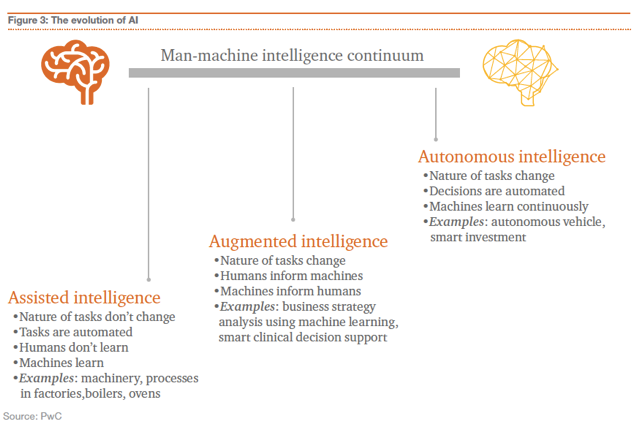 A recent report by PWC suggested that the evolution of AI (and by default, the IoT) will happen along a continuum from assisted intelligence, through augmented intelligence, to autonomous intelligence. At the most basic level AI enables the power of prediction to forecast and mitigate risky events. This enables organisations to use real-time data to determine when machinery and equipment is likely to break down – so action can be taken to prevent failure and its associated cost via pro-active intervention. A second level is the power of prescription. Equipping intelligent sensors with logic to drive action means outages or disasters can be avoided. For example railway track sensors can warn against track failures, or autonomous vehicles can course-correct when the car veers away from the centre of the lane. At an even more advanced level, AI with IoT can deliver an adaptive or autonomous response. This means solutions can incorporate continuous data feeds – where the system learns to take the optimal action without human intervention. So for example in healthcare, blood glucose sensors can alter insulin delivery levels in response to changing patient needs and machine learning is employed to refine and modify dosage in direct response to ongoing data stimulus for the subject. Despite making rapid progress on a daily, weekly and monthly basis, both IoT and AI could be seen as relatively nascent technologies. Smart machines are currently advancing from the ability to handle traditional applications from repetitive tasks to be able to deal with continuously changing tasks, but there is still vast developmental scope. Just as AI and IoT can ultimately empower an adaptive response at an operational level within organisations, so the same, powerful combination is requiring a more adaptive strategic response from organisations. As new technology applications emerge where IoT works hand in hand with AI – the resulting innovations are proving how IoT can create new markets and opportunities, disrupt traditional business models and dramatically change the competitive landscape. Thus companies looking to make the most of opportunities to positively impact revenues, safety, resilience and customer experience are being fast on the uptake of this powerful pairing of transformative technologies. As an investor in early-stage IoT companies, Breed Reply is always interested to hear from innovators and entrepreneurs looking for support to accelerate their ideas to market.